I’ve caught a “Fall cooking” bug lately and I’ve become obsessed with all things Fall. It’s ironic because here in Florida there is no sign of it cooling down any time soon (you can take the New Yorker out of New York but she will always crave that crisp, Northeastern, Fall weather). But it’s not stopping me from using my oven, busting out the Crock Pot and experimenting with Fall recipes. Naturally, when I’m cooking, I’m thinking of what kind of cocktail would pair well with my meal (does anyone else do this?) and I was inspired to search for some Fall-themed cocktails. Apples are big in our house - everyone loves them. I love them so much that they were the one thing I craved during my pregnancies but because of the constant heartburn (read: insides on FIRE 24/7) I wasn’t able to enjoy them. Mimosas are always a good idea. Try this sweet recipe at your next brunch. This recipe combines honey crisp apples, red wine and apple cider for a very sophisticated drink. There’s something about drinking sangria that makes me feel like I’m ”adulting” in a very grown up way. Everything about this cocktail screams fall to me; the apple cider, apple slices, ginger and the cinnamon sticks garnish. The splash of vodka is a warm welcome. Whenever I see one of my friends order a Long Island Iced Tea, I know the night is going to be real fun. So if an apple version of this wild drink is anything like the original, I’d love to sip on it. An even sweeter twist on the classic apple cocktail combines caramel, butternut schnapps and vodka. 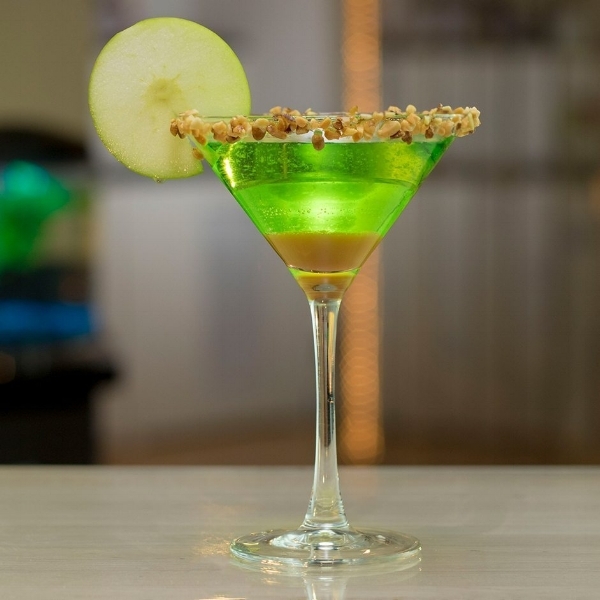 I’ll never get tired of drinking a good apple martini.